Slip, Hardcover, 9.75 x 11.25 in. / 176 pgs / 150 color. Text by Peter Schlesinger, Hilton Als. This collector’s edition of Peter Schlesinger’s A Photographic Memory 1968–1989, limited to 30 copies, includes the book and a C-print photograph titled "The Deck at La Piscine Deligny," signed and numbered by the artist. Schlesinger’s remarkable journey began in 1966 when, as an 18-year-old student at UCLA, he met David Hockney. This was the beginning of a bohemian life in Los Angeles, London and New York, and many travels, photographing some of the great personalities of the day, including Cecil Beaton, Paloma Picasso, Grace Coddington, Tina Chow, Christopher Isherwood, Manolo Blahnik and Eric Boman, to name just a few. 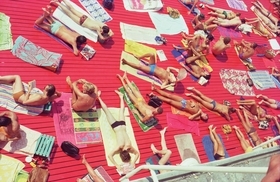 Featured image is reproduced from Peter Schlesinger: A Photographic Memory 1968–1989. 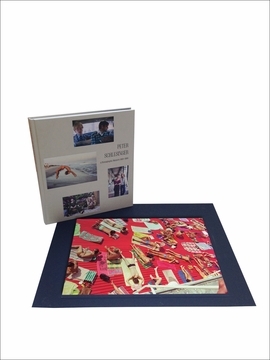 A spectacular monograph of Peter’s photos called A Photographic Memory has just been printed by Damiani, the cult Italian publishers that produce some of the most sought-after photography, art and pop culture tomes today. 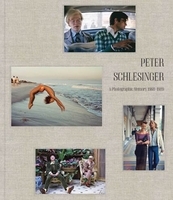 The book is a sumptuous collection of over 30 years of photographs Peter collected throughout his career. Opulent snaps of boozy lunches, candlelit al fresco dinners in France, sleepy mornings in various lavish apartments and hotels all over Europe would be beautiful regardless of who features in them, but that’s where these moments in time become really fascinating: they’re punctuated with some of the most intriguing stars and creatives of the century. Looking at Schlesinger’s photos, you tend to imagine a story lurking below the surface of each image.... A Photographic Memory offers a blissfully carefree record of a lost bohemia. He photographed Manolo Blahnik getting a haircut; the Rolling Stones’s gear during the Exile on Main St sessions at Villa Nellcôte; his many-decades partner, Eric Boman, with their good friend Grace Coddington; David Hockney and Cecil Beaton; Paloma Picasso; Andy Warhol and Rex Reed in the back of a cab; and what seem to be an awful lot of accidentally beautiful moments, the kind of photographs people aspire to carefully orchestrate in their Instagram feeds now. Peter Schlesinger's photography brings you into the world of Andy Warhol and Grace Coddington in the '70s... Scenes like Robert Mapplethorpe on the Boulevard Saint-Germain, Grace Coddington at a café in Paris, or Andy Warhol in the backseat of a taxi were all but an average day in Schlesinger’s world. FORMAT: Slip, Hbk, 9.75 x 11.25 in. / 176 pgs / 150 color.